Aside from screens that are prone to smashing, and disappearing headphone jacks (ahem, Apple), one of the most annoying things about smartphones is just how quickly their lithium-ion batteries drain. Even the latest handsets on the market, touting more advanced features than ever, rarely managed to last much longer than a day without needing to be plugged into a wall – if you're lucky. It feels like there's an obvious solution, right above our heads: the sun offers bountiful energy, and the idea of actually utilising solar power to power our phones is far from a fantasy. We're used to seeing photovoltaic (solar) panels dotted about on houses and office buildings, and they're being increasingly built into smaller accessories, like speakers and backpacks. And the good news is that many manufacturers – including the big guns of Apple and Samsung – are looking to see if the sun can be the answer to our battery woes. So if the tech is available, if research is being done into more convenient, sustainable ways of charging our phones, and if we're all increasingly on board with the idea of using solar power, then why aren't all our phones currently running off sunshine instead of the mains? Charting the history of solar-powered smartphones makes for an interesting, yet disappointingly bare, timeline. Samsung was officially the first manufacturer to bring a solar-powered phone to market, back in 2009. The 'Solar Guru', or Guru E1107, was launched in India to address the problem of regular power outages. The handset was able to provide between five and 10 minutes of talk time off one hour of solar charging. Months later, Samsung brought out another solar-powered device called the Blue Earth, touted as an eco-friendly product and launched in a much wider range of markets, including the UK, but it was withdrawn shortly after – sales figures are nowhere to be found, but it's hard to imagine the technology was anything other than a failed trial. A year later, in 2010, Puma teamed up with Sagem to bring out the Puma Phone, a handset with a solar panel that was supposed to enhance the fitness capabilities of this 'active' phone, which featured step tracking and a GPS chip. However, the solar panel was merely there to keep the battery topped up, rather than provide the primary means of charging – the efficiency simply wasn't high enough, despite the lower power needs of this feature phone. "When carefully positioned, the prototype phones were able, at best, to harvest enough energy to keep the phone on standby mode but with a very restricted amount of talk time. This means there's still some way to go before a workable and care-free solution is achieved." Intriguingly, one of the issues presented by Nokia was this: "The most substantial challenge is the limited size of a phone's back cover, which restricts the extent to which the battery can be charged." Consider how much bigger phones have become in the nearly half-decade since, and you'd be forgiven for thinking that we should be able to power a whole house from the back of a Note 7 (if it didn't set itself on fire first). Fast-forward to the present day, and the most interesting developments in solar-powered smartphones are coming courtesy of a partnership between Kyocera and Sunpartner Technologies. For the past two years, the companies have showed off a solar-powered phone prototype at annual mobile industry bash Mobile World Congress. The latest version of their device needs three minutes of sun in order to deliver one minute of talk time, and comes with an app to alert users about current charging conditions. It's worth mentioning that Sunpartner Technologies have also partnered up with Alcatel, but we haven't seen anything new from that pairing since last year. Perhaps one minute of talk time after three minutes in the sun doesn't seem like an amazing trade-off – but that's still a big improvement on the company's prototype from the year before, which promised only 15 minutes of chat for a whole two hours of charging. What's actually rather incredible about this technology is that the solar panel is in the screen, lodged just below the touch layer, so it doesn't interfere with the design of the phone. Sunpartner claims the visibility of the display isn't compromised, and can provide 'perpetual energy'. This might sound fairly insignificant, but it's a big deal. It means the phone can soak up the sun while you're actually using it – older devices had to be turned upside down to capture the sunshine – and because the panel is under the surface of the screen, it's way less prone to damage. There's been no official release date for this Kyocera and Sunpartner lovechild, but sources are suggesting that we can expect to see the phone that was shown off at MWC 2016 out in the wild at some point during 2017. Of course, just because they don't have anything to show us yet, that doesn't mean a number of bigger and better-known names aren't also experimenting with solar tech for their phones. For instance, the Patently Apple website has an entire section dedicated to the subject, which suggests it's only a matter of time before one of the world's biggest brands adds solar power support to its iPhones. What does the future hold for solar-powered tech? The Kyocera phone could set a huge precedent for the future of solar-powered tech. If Sunpartner's transparent photovoltaic material delivers, it's likely to be snapped up by many more smartphone manufacturers than just Alcatel and Kyocera. And there are plenty of similar materials being pioneered in the photovoltaic space. A company called Ubiquitous Energy, part of MIT, has created a kind of tech that acts as an invisible coating, designed to transform any surface into a solar panel. Up until now, solar panels have been dark, based on the science that darker and denser materials tend to absorb more light. Ubiquitous Energy's material, however, is comprised of organic molecules, which can absorb both ultraviolet and infrared rays. As this light isn't visible to humans, the coating looks clear. It also doubles up as a semiconductor, which means that when photons hit its surface, they excite electrons, causing them to flow as an electrical current to power your device. Sadly, the scale of the material currently can't generate enough energy to be practical for use in phones – which leads on to another interesting consideration, about how much energy is actually needed to create the solar-powered technology in the first place. And that brings us to the most important question: are we there yet in terms of the technology to create a PV panel that can really charge up our phones? We asked Kevin Schofield, Director of Project Rome, to gaze into the future a little and guess how much energy would be needed to charge up a standard iPhone, as well as the time it would take to get it, and what that solar panel would look like. Based on data from The Eco Experts he told us: "An iPhone needs around two hours of charge at 12w. If the PV panel is 17% efficient (according to the Eco Experts) then you would need a 70w panel (12w/17x100) in direct sunlight for two hours. A 70w panel would be 770mm x 676mm x 25mm." "So basically you would need a 0.8m by 0.7m panel to charge an iPhone currently based on the available PV efficiency!" In addition, we may all think we're saving the planet by not plugging into the wall – but what about the time, money, effort and, erm, electricity needed to make your shiny new solar-powered phone in the first place? Schofield believes we've got some distance to go before the energy-saving benefits of using such a phone outweigh the environmental cost of making it in the first place. "To truly consider environmental impact we must consider the energy, water and chemical and manufacturing processes associated with creating the PV technology," he says. "This 'embedded' environmental impact may just tip us over the environmental benefit edge." The other issue is how sheltered – literally – an existence we live these days. Human behavioural traits are as important as the tech when it comes to solar-powered smartphones. 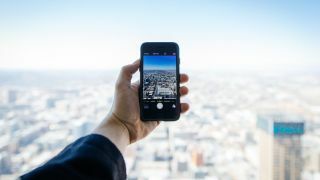 For the solar-powered tech built into your phone to work, you'd need to spend a considerable amount of time outside; not necessarily in direct sunlight, but in ambient light, which would still be tricky to guarantee in certain markets. That means people may have to change the way they behave in order to reap the solar rewards – most of us keep our phones stuffed into a pocket or a bag for much of the day, after all. There's clearly potential for solar-powered smartphones in the future, especially if the materials currently being developed deliver. But right now, for a mixture of environmental and practical reasons, we shouldn't be expecting our next smartphone to be solar-powered – or even the one after that. It's pretty clear where solar-powered phones will be launched first: places without ubiquitous power supplies (and brighter days) will be the proving ground for such technology, as long as the manufacturing costs continue to fall. Cell towers have already been converted to solar power in places like India, replacing polluting diesel that require constant refuelling – if the same could be added to phones, it would revolutionise services for areas with limited power supplies, so the motivation to create solar-powered phones (or at least photovoltaic charging stations) is high. In the meantime, if you're keen to be more environmentally-friendly when it comes to tech, it might be a smart move to use electricity generated from your rooftop PV panels until the smartphone market has caught up.